Señor Mex says: Pick out your Mexican Insurance with Mexican Insurance Store before you read this article, because you will be left hungering for more than just one of the delicious specialty tacos featured. 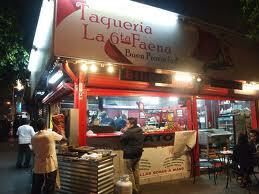 As the article discusses, Tijuana is a fantastic venue for finding delicious tacos. ¡Bién ricos! The fare is so fabulous that many from San Diego and Los Angeles will make the quick border crossing just to eat at their favorite stands. Everyone who finds a fave is difficult to persuade about others. However, there are those who love to experience the variety of options. , you won’t want to settle for a border booth policy. Mexican Insurance with Mexican Insurance Store online quote tools are ideal for providing you with some choice about indemnity limits, time periods and add-on features. If you want to frequent your favorite taco stand on a whim, it’s definitely wise to have a full-year policy that will enable you to cross at your leisure. Read the entire article, with photos, here. Previous post: Mexican auto insurance for Canadian drivers and Baja beauty!